Bill Hader spent eight seasons on Saturday Night Live before striking out into the world to play quirky guys in movies and make Documentary Now! Last night he returned to promote Barry, the HBO series that marks Hader’s long-awaited arrival as a leading man. As excited as we are for that debut next week, it was refreshing nonetheless to have Hader back in Studio 8H. He’s one of his generation’s finest sketch performers, a standout in an SNL cast that included Will Forte and Kristen Wiig. For all my antipathy towards SNL, a show that condemned itself to irrelevance years ago, I cannot deny that it’s a pleasure to see him in his element. Well, okay, except for two bits that weren’t pleasurable at all, both in early in the episode. His monologue, in which he explained things he “learned” about SNL since leaving the cast, like that the fake commercials… aren’t real, was a total flop. Like many monologues by hosts who aren’t stand-up comics, it was a list of observations that would be funny if they were true, but they aren’t true, so they’re not very funny. (See: Gal Gadot riffing about how people think she’s actually Wonder Woman.) Hader seemed aware of this and self-consciously cut the sketch short, though I still have to wonder why SNL’s huge team of joke writers seems so averse to just writing a few actual jokes. From the monologue they segued immediately into “The Californians,” a beloved recurring sketch that I’ve never gotten into, being more of a Vincent Price man myself. What was doubly frustrating about this installment is that Pete Davidson, normally a rare and welcome presence in ensemble pieces, shows up to undercut the whole thing: as the son of the recently deported (oof, why!) maid Rosa, he asks everyone why their accents are so strange, noting that he’s from California and has never heard accents like the ones that define the bit. In case you were too dumb to get it, the joke in this sketch about weird people is that… they’re weird. Thanks! That wasn’t the only time this episode undercut itself. The joke in “Irish Dating Show” is that two of the contestants—the two Irish ones, the third being American—are the bachelor’s (Hader) cousins, so naturally he’s more attracted to them than the outlier. As soon as the first cousin’s (Cecily Strong) relation is revealed, however, the other two contestants balk at how everyone seems cool with this. From there the sketch is yet another tedious exercise in bragging about its premise. “Girlfriends Game Night” takes a similar, albeit less explicit approach. Cecily Strong brings her elderly, wheelchair-bound husband (Hader) to a game night with friends (Heidi Gardner, Aidy Bryant, Melissa Villaseñor), where his Cialis unexpectedly kicks in. Since they’re trying to conceive, she, er, hops right on, keeping below a courtesy blanket to keep things modest. Then it’s three minutes of everyone arguing about whether this is acceptable behavior. This sketch was less grating than the previous examples, however, for two main reasons: first, Hader’s character is weirder and funnier; second, just about everyone breaks character as he piloted his wheelchair into all the furniture, adding another layer of comedy to the whole thing. The writing may be dull, but the action turns out to be quite fun. As they were when Hader was in the cast and Barack Obama was president, the best sketches were the ones where silly characters did silly things in their own, self-sustaining sketchworlds. “Jurassic Park Auditions,” or five minutes of celebrity impressions coupled with Jurassic Park riffs, was probably an episode highlight. 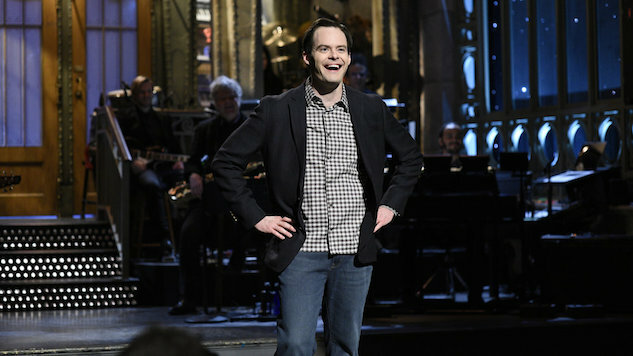 So was Hader’s return as Stefon, of course, and particularly the line, “I don’t trust any dog whose stomach touches the ground.” Pete Davidson appeared for a remarkable “Weekend Update” segment, criticizing athlete Kevin Love’s recent op-ed about mental health; Love, Davidson argues, waters down the severity of the issue. The bit is frank and dark in a fashion that you don’t normally see on SNL—the show that handled the Aziz Ansari allegations with a sketch about how hard it is to talk about the Aziz Ansari allegations—and Davidson loses no laughter for his candor. I can’t say the same for Michael Che’s earlier quip, about the Houston Astros’ visit to the White House, that “Baseball is the one industry where immigrants are taking our jobs,” but then again there’s a certain pleasure to seeing bad jokes flop. And bad sketches, like “CBC Report,” a befuddling nonstarter of a #MeToo take that envisions Canada’s Harvey Weinstein: a producer (Hader) who becomes embroiled in scandal after sexually harassing an employee, that is, by telling her she looks nice and immediately resigning. The joke is that, don’t you know, Canadians apologize profusely about the littlest things, but it’s girded by the fear of overreaction that’s fueled so much conservative reaction to this movement, including on SNL. (See: that Aziz thing a few sentences ago.) And given that it wasn’t pegged to any specific news event, the whole sketch had that weird feel of writers thinking they’re making a great point when in fact they’re not saying anything at all. In other words, I suppose, it was vintage SNL.